1. I once fed almonds to a kangaroo. 2. I have never eaten steak. 3. I go to the circus every single year. Two of those statements are true. One is a lie. So, which one is it? 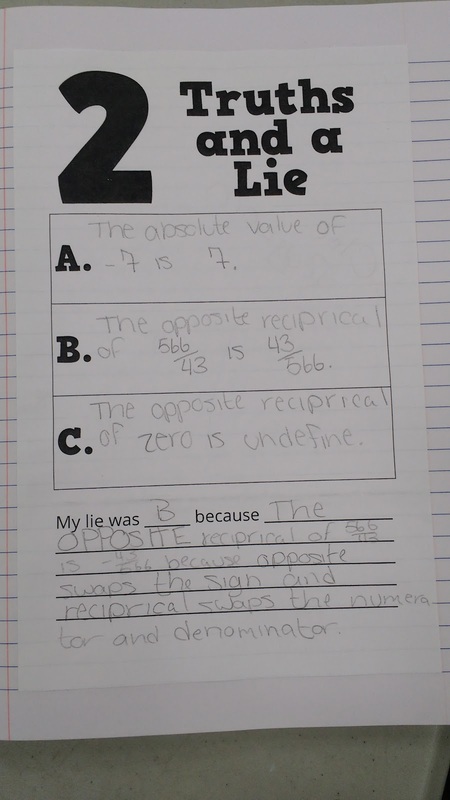 If you guessed that number three was the lie, you were correct. To make this into a math-y or science-y activity, I have my students write three statements about our current topic of study. Two of them need to be true. One of them needs to be false. In the past, I've just had students write their statements on dry erase boards and share them with the class. This year, I decided to have students create a page for their interactive notebooks. 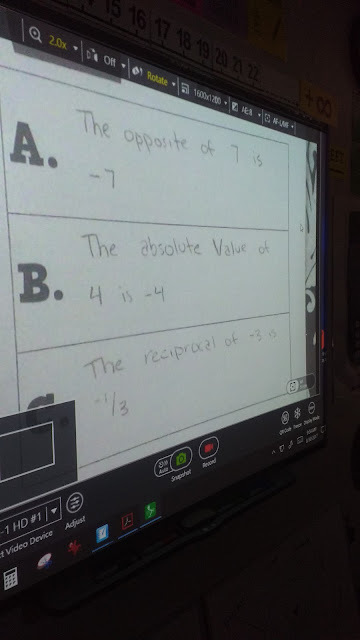 I used it for the first time when my Algebra 1 students were reviewing the definitions of absolute value, opposite, reciprocal, and opposite reciprocal. I instructed my students to fill the boxes for A, B, and C with two truths and a lie. I told them to leave the bottom of the page blank for now. 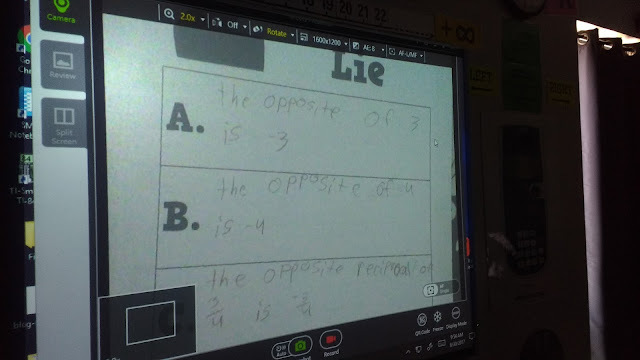 After students wrote their two truths and a lie, I invited students to place their paper under our document camera (affiliate link) for the class to see. 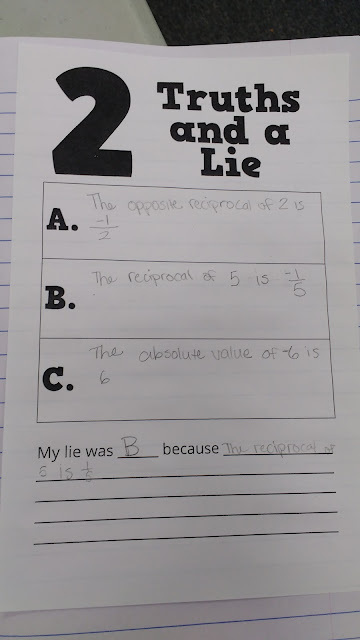 The class then had to figure out which statement was the lie. 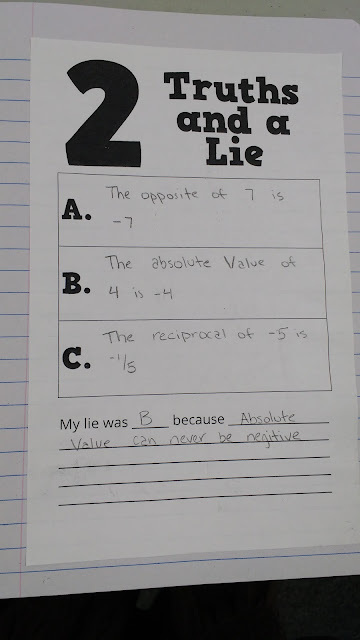 Some students really liked getting to show their statements off to the class. Others refused. I just let those who wanted to do it volunteer. It turns out it's really hard to take pictures of using a document camera! 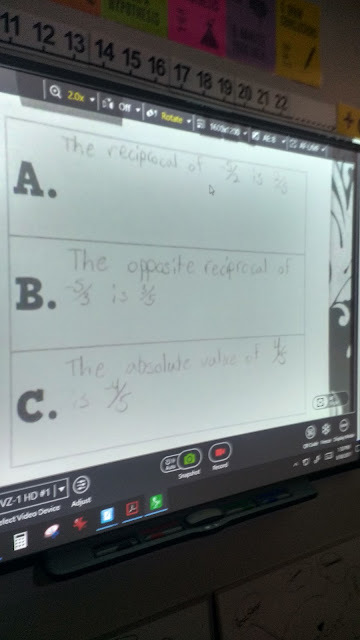 We had to turn the lights out in the room for students to be able to see the pencil markings come up on the document camera. Once everyone who wanted a turn had a chance to share their statements with the class, I had my students complete the bottom of the paper. 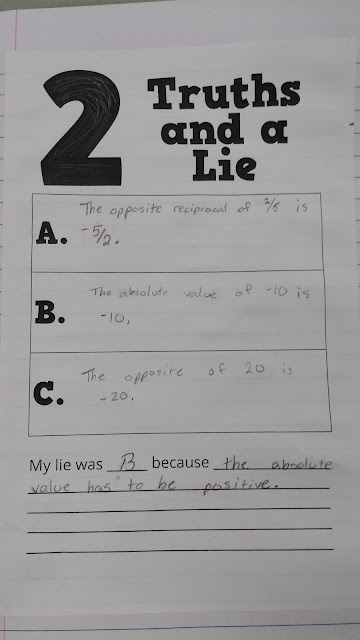 They had to specify which statement was a lie and WHY the statement was a lie. You can download the template I created for this activity here. Love this idea and template! Only my second year teaching and planning on using this and your domain/range stuff this unit! !